The Aztec Calendar Stone with its myriad symbols of celestial bodies and intricate carvings is a recognizable icon of ancient Mesoamerica. In its center is the terrible sun god, Tonatuih, who holds a human heart in each of his hands while his razor-sharp tongue flicks between his lips serving as a ritual blade for sacrifice. When the Spaniards conquered the Aztecs, they discovered the massive 24-ton carving and buried it on the site where the Cathedral of Mexico was built. Out of sight, out of mind. More than 250 years later, however, it was found by accident during a renovation of the church. It has since been moved to Mexico’s National Museum of Anthropology where today it is among the most visited artifacts at the prestigious world-renowned museum. That same image is now recreated on a highly-pure silver round that replicates every design of the gigantic stone tablet. Struck by the Golden State Mint in a full troy ounce of 99.9% fine silver, the 2018 Aztec Calendar One-Ounce Silver Round is as an impressive piece of numismatic art as you’ll ever see! The obverse of the piece features a dramatic portrait of Emperor Cuauhtémoc, the last Aztec king of Mexico, wearing a traditional headdress and ear ornaments of the Aztec elite. At 39 mm in diameter, it’s a large silver piece that will come in gleaming Gem Brilliant Uncirculated (BU) condition, meaning that it is the product of a superb strike that places it firmly among the elite of the run. In 1519, at the height of its power, the Aztec Empire controlled most of central Mexico including what has since become Mexico City. It was at this lofty point in its history that Spanish explorer Hernán Cortés and his army of conquistadores arrived and took King Montezuma II prisoner before laying waste to the empire. After the ultimate defeat of the Aztecs in 1521, Cortés had their last king, Cuauhtémoc, arrested. According to many historians, Cortés kept the young king prisoner and tortured him for several years before finally executing him in 1525. Cuauhtémoc is revered today in Mexico for his heroic defense of the country against all odds. His face is everywhere throughout the country on bank notes, paintings, statues, fine art – and now on these incredibly detailed one-ounce silver rounds! Students of history, lovers of Mexico and its culture, and silver stackers alike will all be vying for this coin. Make it part of your collection by adding one – or several – to your cart today! STUNNING DESIGNS PAYS TRIBUTE TO MEXICO’S AZTEC EMPIRE – the design of the Aztec calendar on the reverse and Emperor Cuauhtémoc, the last Aztec king of Mexico, on the obverse create a magnificent pair of designs. 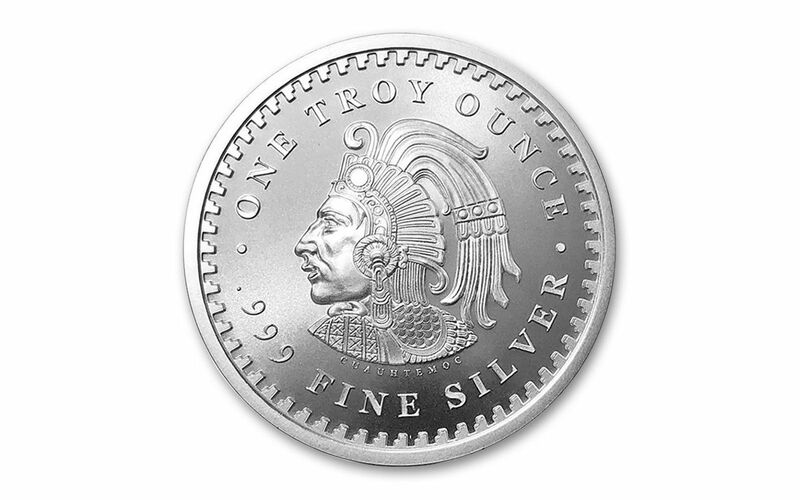 Along with the portrait of Cuauhtémoc you can also see the round’s silver purity -- .999 FINE SILVER – and weight – ONE TROY OUNCE. 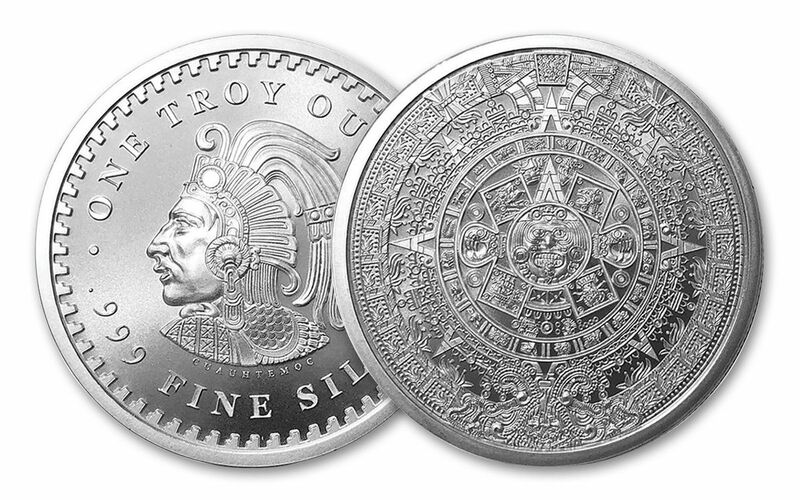 STRUCK IN HIGHLY-PURE SILVER – The 2018 Aztec Calendar Silver Round is struck in one full troy ounce of highly-pure 99.9% fine silver. 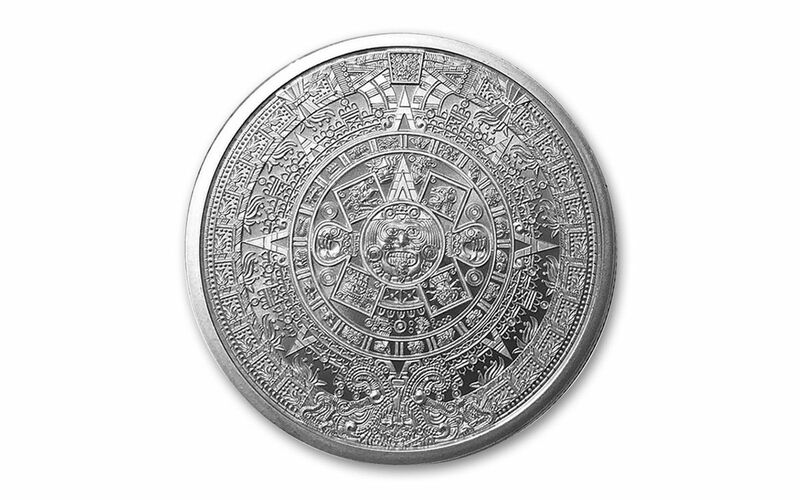 GLEAMING BRILLIANT UNCIRCULATED CONDITION – Your 2018 Aztec Calendar One-Ounce Silver Round will come in gleaming Gem Brilliant Uncirculated (BU) condition, as fresh and crisp as the day is left the mint. The 2018 Aztec Calendar One-Ounce Brilliant Uncirculated Silver Round beautifully pays tribute to Mexico’s rich history and culture. Order yours now!